On August 4th, Cate Blanchett’s new play, The Present, made its debut in Sydney. Read below the entusiastic reviews, and have a look at the behind-the-scenes and on stage performance. Cate Blanchett attacks her role, and the tenets of the text, with a forceful conviction that can only emerge from the extremely talented. The star’s undisguisable passion for her craft is a coherent match for the determination and fortitude of Anna, a woman coming very close to the end of her tether. Her portrayal of drunken and unhinged abandonment in Act Two is sheer theatrical delight, and a beautiful blend of studied precision with courageous impulse. 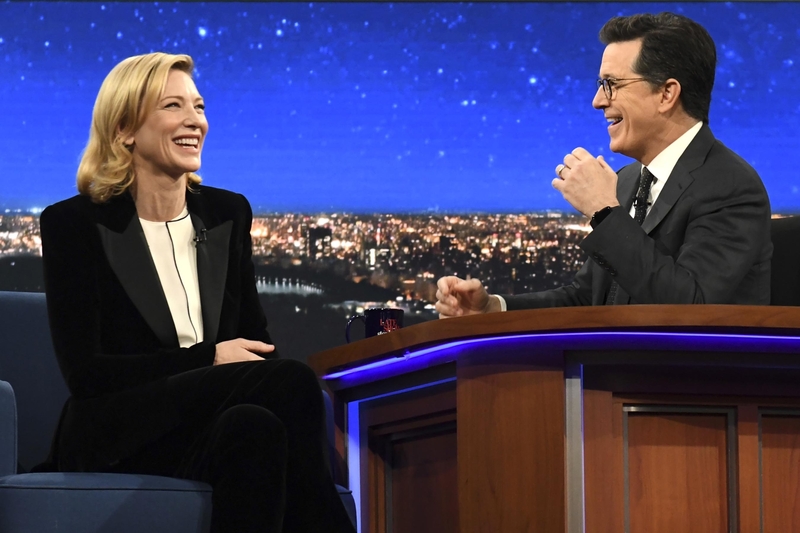 Blanchett’s incredible allure keeps us spellbound, and she uses it to deliver the many thoughtful intentions of the play, which we absorb with enthusiastic acquiescence. The thirteen-strong cast here are all impressive, even if they are only in a few scenes; as the old adage goes, ‘there are no small parts, only small actors.’ Led by Richard Roxburgh as Mikhail (Platonov) and Cate Blanchett as Anna, the production shows just how interlinked this whole group of people are, how much they all depend upon each other for survival and well-being, and this is one (among many) of this production’s great strengths. Roxburgh’s usual almost-neurotic stage-presence is here toned down, and he has a number of quite poignant moments, more often than not with Blanchett’s Anna. Rather than an overbearing and self-centred character as he could very easily be, Roxburgh plays up the tragicomedy in the role, and comes to stand for every single one of the others, whether they know it or not, with their dashed dreams and shattered hopes. Blanchett’s Anna is a force to behold, blowing her way across the stage like a whirlwind, equal parts passion, compassion, tenderness, and untapped conviction; there are many beautiful moments to her performance, not least the end of Acts Two and Four. With Roxburgh and Cate Blanchett earmarked for these roles from the off, who can blame him? Their chemistry is electrifying as ever. But The Present is a true ensemble piece, both in its expanded characters and the near perfect cast who bring them to life. Their constantly overlapping dialogue and emotional dance moves are masterfully choreographed by director John Crowley, particularly in the supper scene at the centre of this long day’s journey into the night. Jacqueline Mackenzie is spot on as a do-gooding neurotic, Eamon Farren brings an air of menacing entitlement to his rich kid DJ type. But no one plays drunk quite like the Rox, his Rake persona turned up here to 11. No one else except Blanchett who moves from bored languor to free abandon and back again with total conviction. But his cast is all deft and intelligent when it comes to comedy and the crucial element of comic timing to land the most rewarding repartee. Roxburgh and Schmitz excel in casual insults, particularly, and Ryan captures a very Australian self-deprecating sad-sack vibe that’s immensely appealing, even in The Present‘s world of 1990s Russia. Susan Prior’s sweet, well-meaning awkwardness as Sasha was played for laughs but behind them, clearly, remained the warmest of intentions. Eamon Farren’s crass DJ Krill demanded laughs and received them easily; the entire cast, this large and unreasonably talented ensemble, chartered the rise and fall from laughter to anger to tears very well. And then there was Roxburgh and Blanchett, sharing a single chair on a bare stage, wondering if there was ever going to be a golden time for them again, these tough, aloof ones who had learned to move above feelings rather than within them, and they captured perfectly between themselves the question at the heart of Upton’s script, a true Chekhovian question: how do we live in the present knowing what we’ve learned from the past, and realistically understanding that the future isn’t full of endless possibilities after all? Roxburgh delivers the best performance I’ve seen from him since Belvoir’s Toy Symphony, revelling in a role that requires him to demonstrate just about all the non-admirable qualities you can imagine fitting into one man. After a repressed start, Blanchett pulls out all the stops, unleashing Anna’s wild side in an orgiastic second act. Headlining a cast with Hollywood A-listers is inevitably a gift for drawing punters to a show, but Sydney audiences should also count themselves extremely blessed to have actors of the calibre of Blanchett and Richard Roxburgh willing to dedicate themselves to live theatre. Together Blanchett and Roxburgh’s rapport on stage, developed through years of working together at STC, is transfixing. Both navigate the rapidly changing narrative terrain, leaping from zinging comedy to gut-punching pathos, with astonishing athleticism, but this production is far more than just a two-hander. The Present thrives on the complexity of many intermingled lives and thus is a true ensemble effort. The 13 strong cast have worked hard, with director John Crowley, to weave in the nuances and imperfections of every day speech. People talk over each other, words are stuttered and tripped over: it creates a hugely absorbing sense of authenticity to the text that holds a mirror up to our own ways of communicating. The different personas in this complex web are all skillfully realised – particular praise must go to Jacqueline McKenzie’s Sophia, full of moral outrage and desperate frustration, and Martin Jacobs’ Alexei, groping for his youth but clinging pathetically to the past – however with stars that burn as brightly as Blanchett and Roxburgh, some of the performances from the less experienced cast members occassionally fall short of these stratospheric standards. This immense empathy to the emotions on stage is only possible through the strength of an incredible cast – Blanchett’s Anna is incredibly captivating, her character is perhaps the most complex and unsettling on stage and this is brought out perfectly during the performance. Petrovna is a beloved widow surrounded by her admirers at this party. She is clearly a master manipulator, working to change the wants of her friends and associates, although they don’t always know it. Blanchett, as Petrovna, bubbles with enthusiasm and youthful energy in the beginning of the show, in an attempt to mask the fears that occasionally rise to the surface. Petrovna’s party is occasionally so busy it’s hard to follow, but so is talk at every lunch party with an eclectic mix of old friends. The friends had a daunting, sprawling web of relationships that were hard to understand at first, and Upton’s script relies on the audience to decipher throwaway cues to map the web, but that work is largely rewarding. As the first act progresses Petrovna can’t quite hide the dark intensity and instability lurking beneath the chatter. Blanchett handles Petrovna’s seemingly uncontrollable emotional extremes well – a complex dichotomy of grace and power. Roxburgh and Blanchett are superb, but allow everyone around them to shine, however many lines, however little stage time they have to play with. It’s very much an ensemble effort and all the richer for it. The Present is an exquisitely enjoyable outing to cherish.